What major projects do you think we'll see in the next couple years after the economy has recovered? I would place my bet on 300 South Tryon. The reason is their website is still running and the news, webcam sections all say "coming soon!" That makes me think it'll most likely be the next project started in the near future. Additional Terminal at airport with full service light rail connection to city. ^Those are great long term goals, but I know we're not even going to see half of them come about within the next few years, if by that we mean in the neighborhood of 5-10 years. In terms of actual projects, I'm most hoping to see 300 S. Tryon eventually built. And hopefully we'll see something come to the surface lot between the Gantt Center and St. Peter's. It's a pipe dream, but I'd love to see this project be resurrected. I don't see anything Ghazi is involved with jumping back on this list anytime soon. I don't see any condo towers starting construction within 5 years. I actually was brainstorming about this several years ago, and trying to determine how to create a fashion incubator. I would love to get a warehouse in the NoDa area and convert a portion to group quarters housing/sweat shop and let aspiring designers go wild...live free/free materials and have weekend sample sales, with the house keeping a share of the profits and rights to the designs...retention in the co-op would be based on sales successes......I ran the numbers and it would take a decent grant/donations to make it work, and I got lazy at that point. 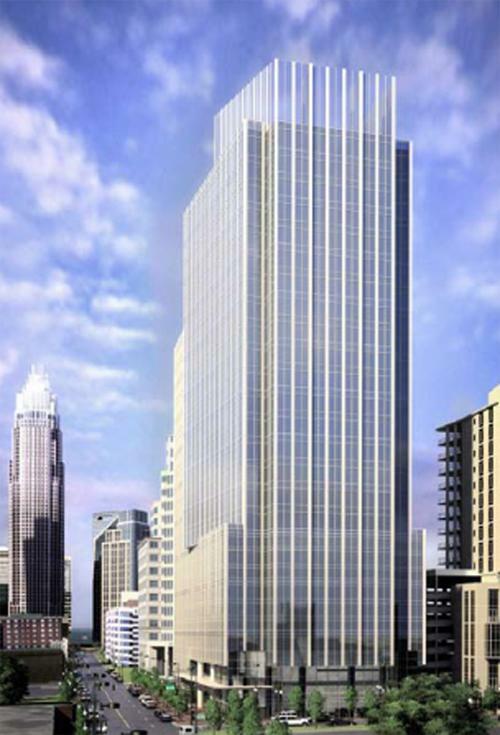 I would really love to see that 631 North Tryon street project come alive. It looks really neat. I never heard about it until now. I forgot all about that project, it would really REALLY extend our skyline. That would be great. It would add some much needed height and life to that part of town. Also, I would like to see 300 S. Tryon get built as well as the center city park. Anything that saves that building and puts it to good use, I'm in favor of. That plan sounds like a really good one. What's the story with that building? Owners holding out for big-money? It would be nice to read about some interest in the parcels freed up when I-277 was configured. Yes, I've wondered about that as well. If memory serves me, wasn't selling those pieces of land part of the plan to pay for the Nascar HOF? If I'm not mistaken the properties are advertised as "for sale". Definitely a good chunk of land. I think it would be a good spot for some sort city landmark. I haven't heard anything new other than our buddy Jerry Reese throwing a fit over the VA Paper Company building needing some repair. Commuter rail or LRT to Monroe. If you are on Independence in the morning or afternoon, you will know why I am for a Commuter rail or LRT. I would keep an eye out for a twenty something story mixed use building on the light rail. Right over there near Pewter Rose. What ever happened to the design center tower in Southend? Same as the Harris development or is it just on hold until the climate improves? Massive entertainment park proposed for Philip Morris site in Carrabus County. Pardon the ignorance here, but would the stimulus money be a grant or would that be something that would have to be paid back. I like the idea of an attraction like this, but I'm not comfortable with the notion of the developers asking for taxpayer money to help build something that will be profitable for them. Yeah, it will create jobs (a few thousand jobs right off the bat I seriously doubt though), but a vast majority of those jobs will be service and other low wage jobs. Hardly the type of jobs that give people significant disposable income, but then a minimum wage job created is better than no job I suppose. And I just don't see this attracting the visitor numbers they are projecting. At least not for a very long time. So many people nowadays simply do not have the money to enjoy something like this and some that do are reluctant to shell the money out for it. To me it's just a public subsidized development for some people who want to fatten their wallet. Maybe I am looking at this wrong. If so someone please clarify. Don't get me wrong, I'm not opposed to using stimulus money for appropriate things. An opera house, theater, museums, parks/public spaces, etc. Projects that add cultural significance to the area and also doesn't slip money directly into a private developers pocket. I am beginning to feel that the practice of requesting stimulus money for projects is getting a little out of hand. Some developers, I feel, are starting to figure out ways to take advantage of it. The stimulus money that Stargate receives would be in the form of a loan which they would pay back to the federal government directly. The hope is that the site would be completely debt free in 5 years. If the company is telling the truth, then they already have 70% of the Phillip Morris building spoken for through letters of intent. Elevation Entertainment and Lamon Records are only part of the equation. The other parts may include an auto parts manufacturer, electric car manufacturer (Maybe Li-Ion???? ), candy manufacturer, hotel, retirement center, chain restaraunts, and a water park. The job total is set to be anywhere from 2600-4000 new jobs over 5 years. As for the amount of visitors, I don't think that 3 million would be too tough. Heritage USA could bring in 3 million a year. http://www2.independenttribune.com/news/2010/nov/02/federal-stimulus-money-pursued-purchase-former-phi-ar-504111/ I think this article is a little longer than the one previously posted and has a little more info. I debated where to put this thought/question. I understand that the 2020 plan discussed last week (still in draft form) talked about bringing an arts/design school to Uptown. This made me think of the RISD initiative a year or two ago and wonder if that is something that might move forward again? I also wonder about SVA as they had opened a satellite campus for a few years in Savannah though closed after a legal battle with SCAD. I think it would be really cool to build the school on the North Tryon Street area by McColl and the NC Dance Studios and near the UNC Charlotte uptown building. It would add a nice solid anchor to that part of the strip (This last part is just speculative dreaming). Anyone heard anything about the Arts/Design school issue?